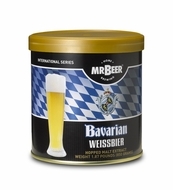 This Mr Beer Bavarian Wiessenbier Brew Pack comes with everything you need to make a great tasting 3.7% ABV beer. Each refill includes: (1) hopped malt extract (HME), dry brewing yeast, and no-rinse cleanser. The Bavarian Wiessenbier is pale gold in color with a subtle fruity flavor and a soft clove palate. This is a favorite beer of Bavaria, Southern Germany.